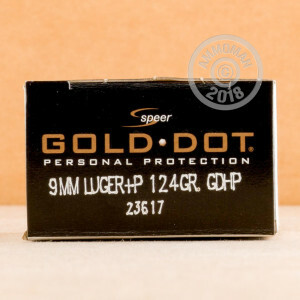 This 9mm +P cartridge from Speer’s Gold Dot line of ammunition features a 124 grain projectile, which is the middle weight for bullets most commonly available in its caliber. 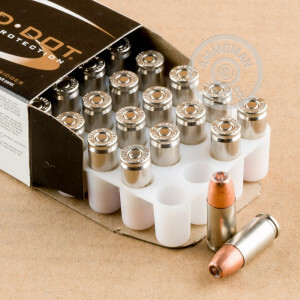 The Gold Dot bullet is revered by law enforcement professionals throughout the country, and for good reason -- its consistency and absolutely catastrophic terminal performance make it a tremendous ally if you’re ever forced to draw your weapon. This bullet’s uniform jacket is molecularly bound to its core, so core/jacket separation is virtually eliminated during penetration, even through rugged barriers. This bullet’s ability to reliably produce six broad petals as it expands gives it the stopping power you can count on in a hairy situation. This cartridge also offers a nickel plated brass casing, which is non-corrosive, smooth feeding, and highly visible even in dark settings. Its powder burns clean to spare your action from needless fouling, and its sensitive primer ensures that you always get a shot. Please note that this is +P ammunition, and must only be fired from weapons that are rated for it. 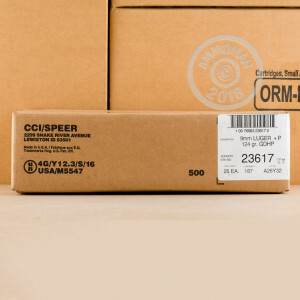 Order these 500 rounds now and enjoy shipping and handling courtesy of AmmoMan.com!